Mr. Hagenbuckle is the founder and managing partner of the TerraCap Management. He has been a successful developer, builder, and investor in commercial real estate since July 1996. Since that time, he has participated in over $1 Billion of transactions across major commercial real estate property types, predominately in the Southern United States. His transaction experience ranges from being a private principal investor to private equity multi-fund sponsor and investment manager covering major property types. He was a founding shareholder of commercial bank Landmark Bank N.A. and Giantbank.com of Fort Lauderdale and was a Board Member and Secretary of the bank for 10 years (beginning in the summer of 2000 until 2010). In the 1990s, he co-founded and sold multiple technology companies to both public and private entities. These companies include Techware Consulting, a technical consulting firm, from December 1995 to November 1997 (sold to CBR NYSE); Orus Information Services, a technical consulting firm, from January 1999 to February 2003; Collegiate Images, a sports media digitization – protection, policing and resale, from August 2000 to October 2008 (sold to XOS) and LandmarkBank, N.A./Giantbank.com, a commercial banking – internet banking business, from 2000 to 2017 (sold to HOMB NASDQ). Mr. Hagenbuckle has been a guest on CNBC, Bloomberg TV and Fox where he discusses real estate market trends and opportunities along with US banking. He has lectured at multiple universities at the graduate and undergraduate levels. Mr. Hagenbuckle is a Florida native who grew up in the Naples, Florida area. He is a graduate of the College of Business from the University of Florida. 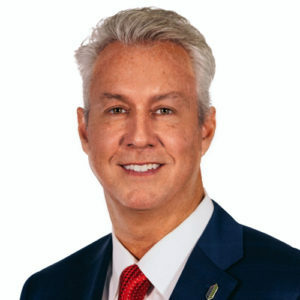 Mr. Hagenbuckle has been a licensed Florida Real Estate Broker since July 2007, a member of the National Association of Realtors since January 2004, has been an active member of ICSC since 2012, and a member of ULI since 2006. He and TerraCap Management, LLC are two-time recipients (2015 and 2016) of the Gator 100, fastest growing active companies founded by University of Florida Alumni. Mr. Hagenbuckle is on the University of Florida National Foundation Board as well as the Executive Board and Chairman’s Circle at the Bergstrom Center for Real Estate Studies at the University of Florida.